Phenylbutazone is a non-steroidal anti-inflammatory drug (NSAID) that is used for treating various joint conditions including rheumatoid arthritis, ankylosing spondylitis, and gout. The drug has antipyretic, anti-inflammatory, and analgesic properties. Phenylbutazone Overdose is the accidental or intentional intake of the drug in dosage higher than prescribed values. Phenylbutazone Overdose may be also referred to as Butazolidin Overdose. Note: Phenylbutazone is not used in medical treatment of humans in the US. The drug is however, used in animals, such as dogs and horses. What are the Causes of Phenylbutazone Overdose? What are the Signs and Symptoms of Phenylbutazone Overdose? The signs and symptoms of Phenylbutazone Overdose can vary from one individual to another. It may be mild in some and severe in others. Several systems of the body, such as the digestive system, nervous system, vascular system, respiratory system, skin and ENT may be affected. 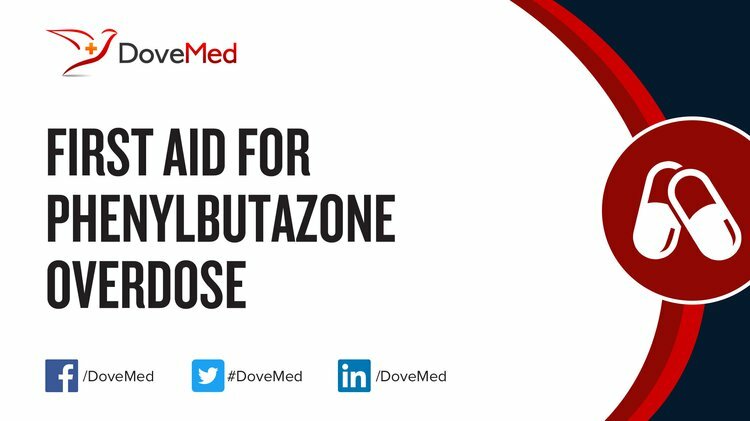 How is First Aid administered for Phenylbutazone Overdose? Who should administer First Aid for Phenylbutazone Overdose? First aid for Phenylbutazone Overdose is administered by healthcare professionals. What is the Prognosis of Phenylbutazone Overdose? How can Phenylbutazone Overdose be Prevented? Toms-Whittle, L. M., Hickey, J. R., & Buckley, D. A. (2010). Bullous Eruption of the Lower Limbs Following Equine Phenylbutazone Injection. Journal of Medical Toxicology, 6(2), 267-268. Monreal, L., Sabate, D., Segura, D., Mayós, I., & Homedes, J. (2004). Lower gastric ulcerogenic effect of suxibuzone compared to phenylbutazone when administered orally to horses. Research in veterinary science, 76(2), 145-149. Liang, I. E., Estes, K. E., Bird, S. B., Brush, D. E., Aaron, C. K., & Boyer, E. W. (2004). Acute phenylbutazone toxicity: A toxicokinetic analysis. Journal of Toxicology: Clinical Toxicology, 42(5), 745. Virji, M. A., Venkataraman, S. T., Lower, D. R., & Rao, K. N. (2003). Role of laboratory in the management of phenylbutazone poisoning. Journal of Toxicology: Clinical Toxicology, 41(7), 1013-1024. Dodd, M. D., & Graham, C. A. (2002). Unintentional overdose of analgesia secondary to acute dental pain. British dental journal, 193(4), 211-212. Martínez Aranzales, J. R., Cândido de Andrade, B. S., & Silveira Alves, G. E. (2015). Orally administered phenylbutazone causes oxidative stress in the equine gastric mucosa. Journal of veterinary pharmacology and therapeutics, 38(3), 257-264. Wolsey, B. A., & McKinney, P. E. (2000). Does transportation by ambulance decrease time to gastrointestinal decontamination after overdose?. Annals of emergency medicine, 35(6), 579-584. Ebid, A. H. I. M., & Hana'a, M. (2001). Pharmacokinetics of phenobarbital during certain enhanced elimination modalities to evaluate their clinical efficacy in management of drug overdose. Therapeutic drug monitoring, 23(3), 209-216. Rohde, C., Anderson, D. E., Bertone, A. L., & Weisbrode, S. E. (2000). Effects of phenylbutazone on bone activity and formation in horses. American Journal of Veterinary Research, 61(5), 537-543. Ma, L. (2013). Analysis of nonlinear pharmacokinetic systems and the nonlinear disposition of phenylbutazone in equine (horses) (Doctoral dissertation).